Desfrute de um dia relaxante de navegação ao longo da costa da Sicília em um passeio de barco de dia inteiro a partir de Catania. Seu capitão especialista leva você para além de Aci Castello e Aci Trezza, navegando pela rota que Ulysses fez na "Odisséia". Veja a bela baía de Cyclops (Scogli dei Ciclopi), procure por golfinhos e aproveite a oportunidade de nadar, mergulhar com snorkel e pescar. Você pode até aprender o básico da vela. Tome um delicioso almoço com pratos tradicionais da Sicília a bordo do barco, depois vá até Aci Trezza para explorar a cidade. 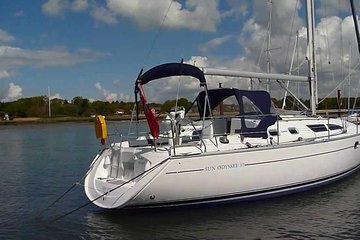 We had a wonderful day out sailing, the captain and crew were welcoming and friendly. The lunch was amazing, some crackers and cheese, 2 types of fish, pasta, fresh vegetables and fruit. They were even some great espresso shots offered. Our family group were 73-27 and everyone enjoyed the day. A fantastic, relaxing trip. We had booked the tour for the day before we went, but due to rain being forecast, and it certainly rained, Bruno, our captain, got in tyouch and suggested we took the trip the next day. We were so pleased as we did not want to miss it. The weather was perfect. After we sailed for a bit, enjoying the wonderful coast line we could jump in the warm sea and swim. My granddaughter loved it and sent quite a time in the sea. I hung on to the side as I'm not a confident swimmer but Bruno was very patient with me. My partner watched and took photographs. Bruno was excellent at giving us information about the coastline and it's history, answering all our questions. Lunch was homemade and delicious, served with wine or beer. We never made it to shore as it was quite windy, so sailed slowly back to Catania. All in all a perfect day. Natasha and I had a full day sailing with Bruno. We were fortunate enough to be the only booking. What an experience! We sailed up to Aci Trezza to see Cyclops' Rock, had many opportunites to swim in the sea, sunbathed on top of his boat, ate really amazing local foods, and were given a really informative and interesting tour of Catania, Etna and Sicily. It was such a memorable day. A highlight was being towed along at a couple of knots whilst in the sea. Thank you, Bruno! Unbelievable experience around some of the most spectacular scenery on Earth! The skipper Bruno - one of the most experienced skippers on the planet after having sailed in all sorts of exotic locations throughout the world - took great care to ensure my wife and I had the time of our lives as we sailed around Mt. Etna, Aci Castello, and the legendary Islands of the Cyclops. A native Sicilian, Bruno's English was better than that of many Americans. His sense of humor, knowledge of the area, and stories of the sea made the trip an absolute joy from start to finish. And what a cook! Prior to the trip, he carefully hand-selected the high-quality ingredients at a local farmer's market for our authentic Sicilian lunch on board, which in and of itself was an epic experience. We cannot recommend this experience enough. Thank you, Bruno! We hope to do it again soon! I booked this trip in the hope it would be a relaxing day on the water, hence giving my parents a rest from the busy week's schedule. I took a punt, as there was only one review but it was very positive and with my previous experiences through Viator I have not yet been disappointed, so I felt confident.